LOCATION, LOCATION, LOCATION! THIS ELEGANT AND CONTEMPORARY CONDO IS READY TO MOVE IN NOW!!! SECOND FLOOR CONDO IN THE DESIRABLE 'EL PASADO' COMMUNITY OF EAST LAKE, FEATURES SPLIT BEDROOM PLAN AND 2 FULL BATHROOMS. MASTER SUITE INCLUDES A WALK-IN CLOSET, TWO SEPARATE VANITIES WITH MAKE-UP AREA AND SLIDING GLASS DOORS THAT LEADS TO THE BALCONY. RECENTLY REMODELED KITCHEN FEATURES QUARTZ COUNTERTOPS, ESPRESSO SOFT CLOSE WOOD CABINETS WITH LARGE CROWN MOLDING, ROLLING PANTRY SHELVES, UPGRADED HARDWARE AND CABINET LIGHTING, FARMERS SINK AND ALL BLACK APPLIANCES. CATHEDRAL SOARING CEILINGS PROVIDE AN OPEN AND SPACIOUS LIVING/DINING AREA WHICH INCLUDES A DECORATIVE FIREPLACE AND NO POPCORN CEILINGS. DESIGNER TILES IN THE KITCHEN AND BATHROOMS, RECENTLY UPDATED NEW WOOD PLANK FLOORING THROUGHOUT LIVING AND DINING AREAS AND COMMERCIAL GRADE CARPET IN THE BEDROOMS. OTHER FEATURES INCLUDE NEWER DBL. PANE WINDOWS IN KITCHEN AND BEDROOMS, SIX PANEL DOORS, UPDATED LIGHT FIXTURES AND CHANDELIERS, INSIDE LAUNDRY ROOM, UTILITY STORAGE CLOSET ON THE BALCONY PLUS A COVERED CARPORT. EL PASADO COMMUNITY IS ZONED FOR SOME OF PINELLAS COUNTY'S BEST SCHOOLS...EAST LAKE HIGH, CARWISE MIDDLE AND CYPRESS WOODS ELEMENTARY!! 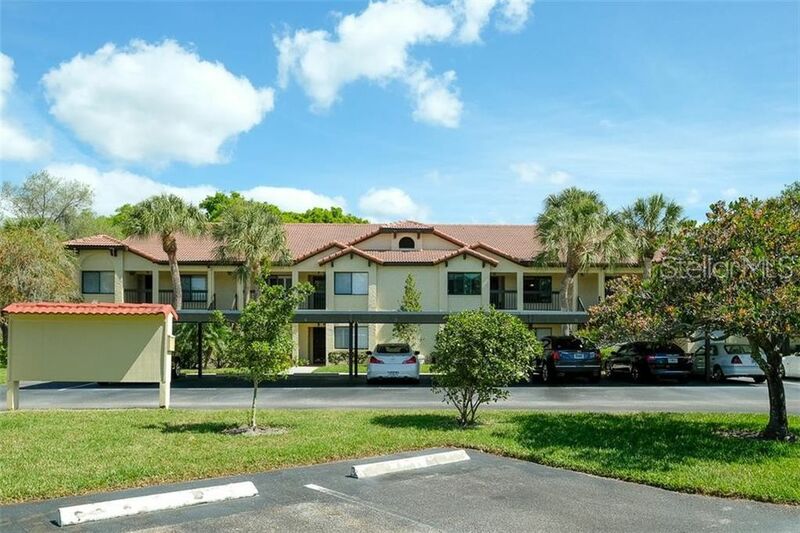 COMMUNITY FEATURES INCLUDE A DELIGHTFUL POOL AND PATIO AREA WITH A BATH HOUSE AND AMPLE ADDITIONAL GUEST PARKING. A MUST SEE!! Directions: EAST LAKE / MCMULLEN BOOTH NORTH OF TAMPA ROAD, EAST INTO EL PASADO COMMUNITY.